Hi everyone! I am so excited that spring is almost here! In honor of spring, we are styling florals this week! I love wearing florals in the spring/summer! This scarf is one of my favorite floral items! I also have this print in the dress! One of my favorite prints by J.Crew! 1. 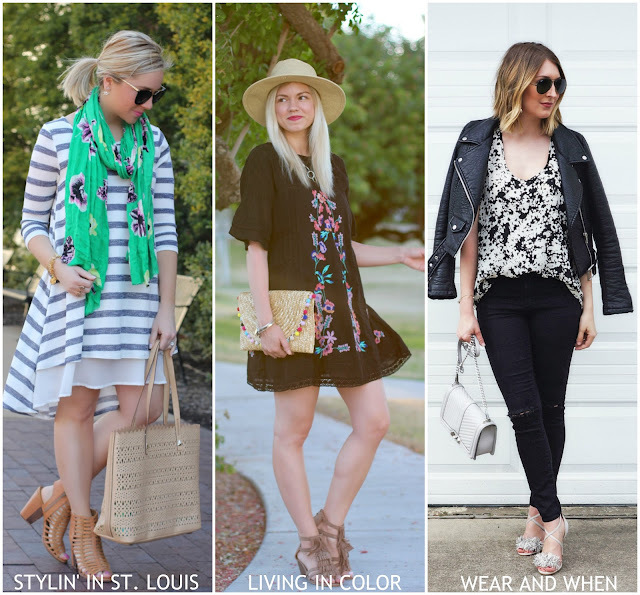 We kindly ask that you follow the two hosts: Elle from Living in Color Style, Jacqueline from Stylin' In St. Louis, and our co-host of Loren of Wear & When via Bloglovin or GFC. Spotlight: Our spotlight of the week is Jill of Doused in Pink! We just love Jill's winter white look! This outfit is so well put together! Her pop of blue in her sunnies is just perfect! Be sure to check out her cute blog! Next Week: Next week out spotlight weekly theme is STRIPES! Thanks for linking up! See you next week! That little dress is so cute, I love anything striped. I'm loving the spring inspo here! The stripes and florals look perfect together and have me so exited for the upcoming season! We just need some of those warm temps over here! 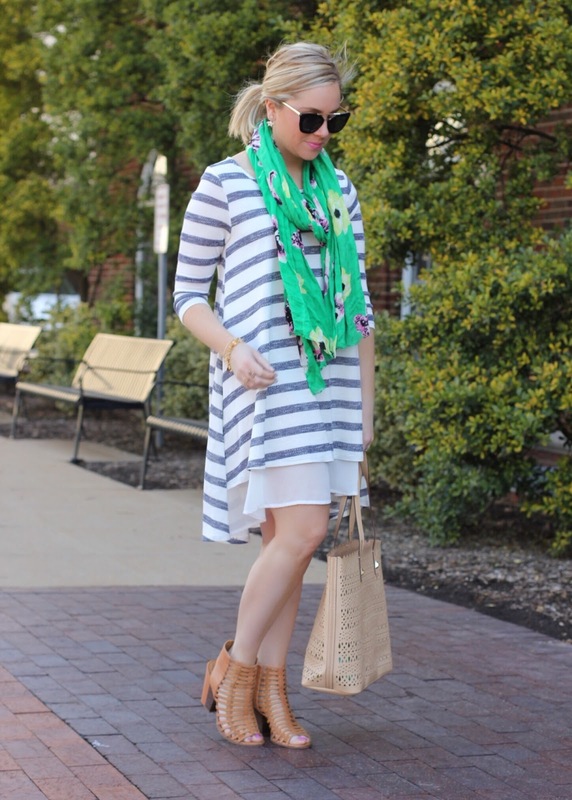 Your striped dress is darling and it looks so good with the floral scarf! Perfect spring outfit! Thank you so much for the feature! It was a nice surprise this morning! That scarf adds so much color to the neutral colored dress. That dress is so pretty, love the layered edge on it. 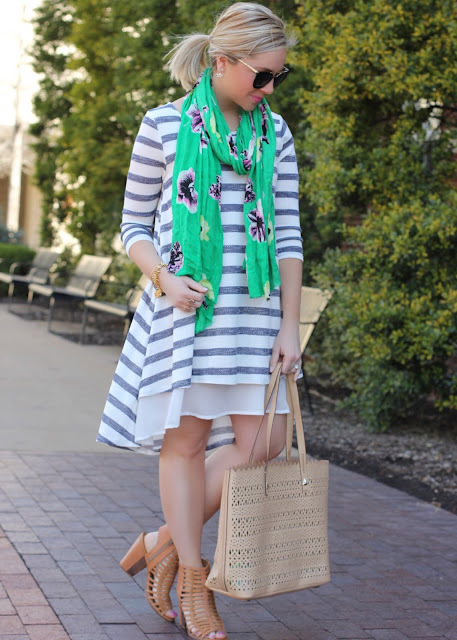 I love how you paired the floral scarf with the striped dress! Too cute! You look so cute! Perfect spring outfit! I love florals! Your scarf is perfect for spring. Love the mix of florals and stripes in a single look - Have a lovely weekend ahead! 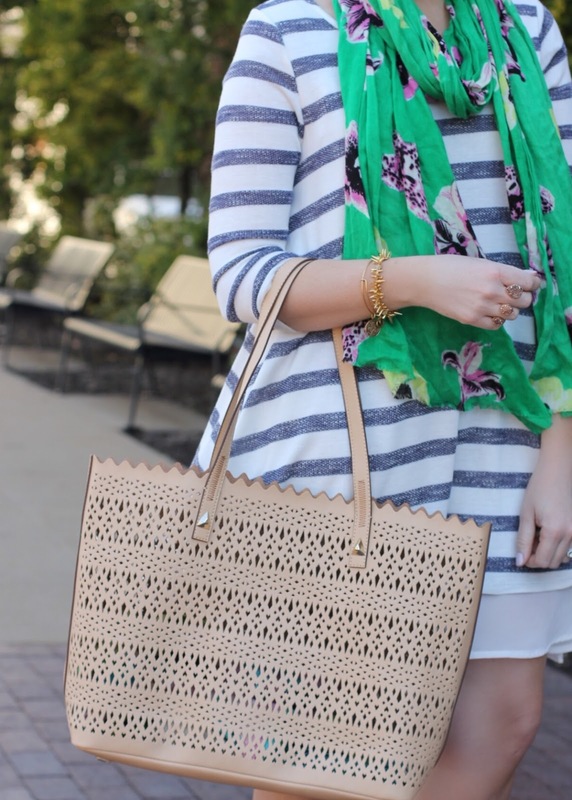 Great flare dress and I am loving the tote! The scarf totally elevates the outfit. Love this spring print! I have a skirt in that pattern. 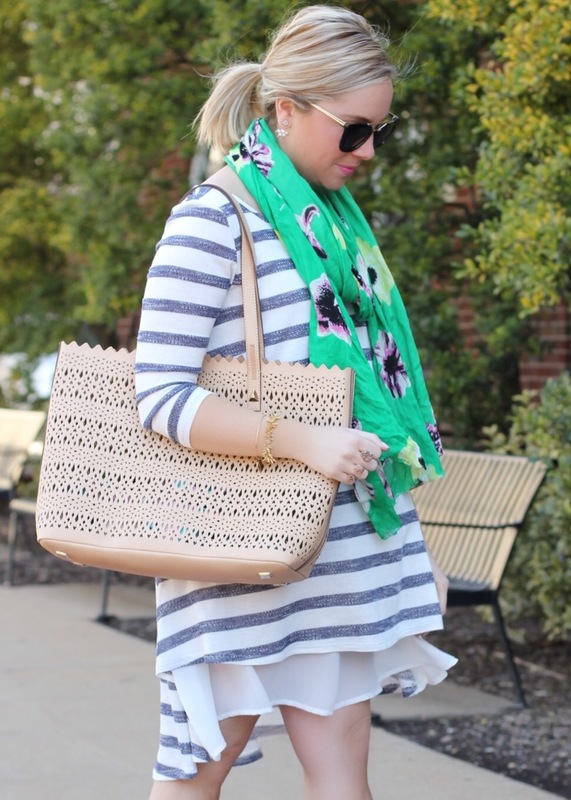 Great pop of color against the stripes! Such a perfect spring look! Love that bag, too! 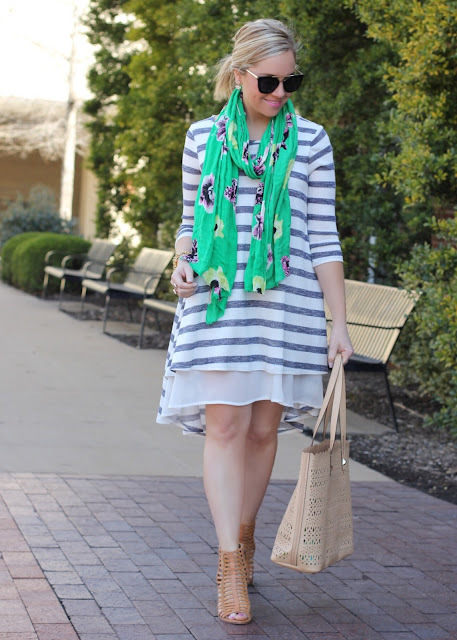 love that striped dress with cute floral scarf! nice! I love that scarf with that dress! Amazing look! Your scarf looks good with your stripe dress! You created a fab look for spring! I love your sandals. Gorgeous! Lovely outfit stripes and floral. Love the unique cut of the dress and your floral scarf is so pretty!